Access to Rachel is free, but the number of visitors at any one time is restricted. Moreover, the reference base is regularly re-indexed, an update scheduled between 3AM and 5AM GMT, taking into account all the constraints of various time zones. During a period of 20-30 minutes, the base may be unavailable or may have a very slow response-time. Rachel’s vocation is knowledge-sharing. However, please contact us before undertaking any large-scale adaptation for your own uses — recuperating bibliographic notes, derivatives, making links, etc. Further, it is the policy of Rachel, as with any bibliographic data base, to indicate the originating library for each reference. We ask you to respect this policy. High-speed connection (DSL, cable, etc.) is not mandatory, but it does facilitate research. The site can be accessed through any Internet navigator, with any operating system. However, all of the functions were developed and tested for computers running Windows XP (and later) and Internet Explorer. With this configuration, users can easily change from a Latin-character keyboard to a Hebrew-character keyboard, one of Rachel’s essential functions. To use this function you must configure the Languages option in your tool bar. 1/ Right-click on the tool bar to select the language option bar. 2/ Right-click again on the language icon (EN for English, FR for French) that will appear in the lower-right of the menu bar, and select the parameter option. 3/ Then configure the language by selecting Hebrew (HE). 4/ By clicking on EN/FR you can change to the HE(brew)-character keyboard. Safari, bundled with Mac OS X. To make this a default option, you must configure the Language option in your toolbar. 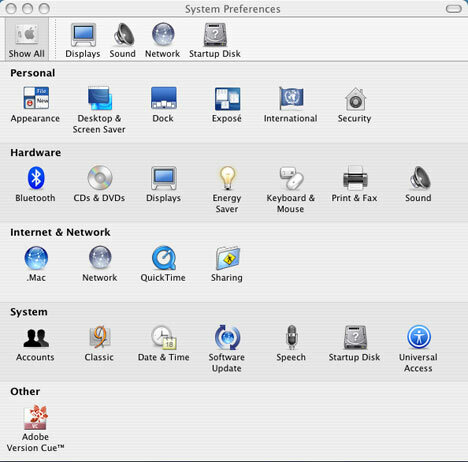 1/ In the apple menu of the toolbar, open System Preferences. 2/ In the International window, choose Languages, then Modify. 3/ In the window that opens, select Hebrew and/or Yiddish (which displays in Hebrew characters). Click on OK.
4/ Return to International window, choose Input Menu. Select Hebrew or Hebrew-QWERTY, depending on which Hebrew keyboard you’re used to; otherwise, just choose Hebrew. - Click on the flag icon in the upper-right and select the Israeli flag. Bringing RACHEL online is a long-term project mobilizing several dozen people for over two years. The catalogue of the Bibliothèque Medem (Medem Library) will probably be the first file fully available and operational. This library’s card catalogue was comprehensive, and was consequently easy to retroconvert. We estimate full online access for Fall 2005. But the work is hardly complete. All of the references will undergo revisions to reflect both multiple copies among libraries and spelling differences between Yiddish and Hebrew. The Subject file will need particular honing. The library of the Séminaire israélite de France (Jewish Seminary of France) had no reliable catalogue. Extensive work was undertaken to elaborate one in collaboration with the Jewish National and University Library, in Jerusalem (JNUL). We are targeting the end of 2005 for a complete catalogue of holdings. The Subject file will be in a primitive state, and will need considerable refinement. The library of the Alliance israélite universelle (AIU), with the largest collections, also suffers from these riches. Its card catalogue reflects decades of the patient labors of successive librarians. We hope that the whole catalogue will be retroconverted by Spring 2006. At that stage, all three libraries will engage in a painstaking process of eliminating duplicates and standardizing references. Until the work is completely finished, we cannot recommend too strongly that you complement any online research with research at the relevant library. Rachel uses Aleph 500 software, from Ex Libris, a program developed by an Israeli company and available worldwide. Aleph 500 was chosen because it utilizes the most widely-used cataloguing standards (Marc 21) and because it can manage simultaneously the different alphabets found in our catalogue (Latin, Hebrew, Arabic, etc.). Rachel is a multimedia catalogue, with access to books, periodicals, theses, manuscripts, archives, photographs, videos and music recordings. Aleph 500 works intuitively, and has a context-sensitive help menu. The remarks which follow are meant as an initial user orientation. 2. List search, which generates an alphabetic list of terms or names including the term keyed in or as close to it as possible. To display references, the user clicks on the term(s) selected. Key-word or phrase search has three levels of complexity. Type in a word or phrase, in Latin, Hebrew or other characters, choose the field for searching this word or phrase. This is a key-word search. This is the “exact search” (“recherche exacte”) function. If you check “Expression exacte : NON,” the search runs the three terms separately, “sciences” OR “du” OR “judaïsme.” The results will thus be very different..
All fields of the zones indexed in the full bibliographic notice, including the notes. Title : words appearing in titles, subtitles, alternate titles, series’ titles, subseries’ titles, original titles. Author : Individual or collective authors. Subject : Subject terms taken from either the subject listings created by the librarians of the Rachel network or from the subject listings derived from recuperated bibliographic references. Subject may be in several languages. Only subject terms in French are regularly checked. You can also limit a search by filtering by language (language of publication), format (document type); year (of publication), library (network member library), function (publisher, editor, translator,...). Searching by year, you can display the latest publications received and you can keep abreast of recent acquisitions. This method allows you to perform a simple search by key-word in selected catalogues external to Rachel. These currently include the Union List of Israel (collective catalogue of Israeli university libraries), the Library of Congress Washington, DC), RAMBI (Index of periodical articles on Jewish topics, published by the Jewish National and University Library, Jerusalem). Further catalogues will be accessible via Rachel as partnership agreements are signed. Use this option to browse through an alphabetical list of the key words displayed at the head of a field. This is the equivalent of searching by word in the drawer of a card catalogue. To search for personal names, enter last names first. 20 results are displayed per page. They include format (document type), author’s name, title of the work, year of publication, and in which library (or libraries) it can be found. To see a full version of the bibliographic reference, users must click on the title or the number to the left, or check the relevant box. By checking several boxes, users create a group of references. By clicking on “Show selected references,” the designated references will open in a standardized format. The standardized format is designed to meet most researchers’ needs. It is only in this format that you can navigate in the catalogue by clicking on a hypertext link — the subject link, for example, to see the other works on the same subject. It also allows you to locate copies at the bottom of the reference. This format allows users to access external links, e.g., the digitized version of a book, or a site relevant to the selected work. The ISBD format uses the traditional presentation of card catalogues. The Citation format enables users to recuperate the specific information necessary for citation in notes for scientific articles. The Champs MARC (MARC fields) and Etiquettes MARC (MARC labels) formats are reserved for library professionals. Under the rubric “Copies” (“Exemplaires”) are the document’s call number, the specific library in which it’s found, and the individual elements particular to each copy (owner’s mark, origin, collector, numbering, etc.). Select “Location” (“Localisation”) in the standard display, or select a library in the results listing. From “Copies” some of the participating libraries will allow you to reserve a document, order photocopies, or see all of the information relating to a given copy. For online reservations and photocopy requests, you must be a registered reader in the library in question, with a user name and password. Please make direct contact with the library of your choice. The problematics of transliteration are complex and not easily resolved. Various systems have been superimposed throughout the ages. As a result, there are numerous transliteration rules applied in the files that RACHELnet is in the process of converting. We cannot urge users too strongly to use your imagination in performing searches, and not to limit a search to a single transliteration. With the progressive integration of Hebrew characters, the system of transliteration is becoming obsolete. Standardizing transliterations is a very long-term procedure, which will take a number of years. We are aiming for the following system. Only the transliterated forms retained will appear in Rachel. The rejected forms are accessible in a “multilingual thesaurus” link. Rejected forms of transliteration can be used for a search, but any results will be displayed in the standardized form. If you search for Purim, the system results are displayed under Pourim. These will be the same references as if you had searched under Pourim. 1. Absence of diacritic marks: Yiddish appears without any diacritic marks. Thus an aleph could correspond to a komets-aleph (O) or a pasekh-alef (A); tsvey yudn could correspond to either tsvey yudn (EY) or to pasekh-tsvey-yudn (AY); there is also no khirik. The letter pey represents either a pey (P) or a fey (F). cataloguing by the librarians of the Medem Library-Paris Yiddish Center (Bibliothèque Medem-Maison de la culture yiddish), by librarians from the AIU (Alliance israélite universelle), or librarians at the SIF (Séminaire israélite de France). In this case, names of Yiddish-language authors follow Yiddish spelling. retroconversion based on the cards of the JNUL (Jewish National and University Library, Jerusalem). In this case, the names of Yiddish-language authors were written following Hebrew spelling rules. Modifications are under way, but will take several months. In this period, some works written by Yankev Glatshteyn, for example, will be found under the spelling as in Yiddish, and others under the spelling as in Hebrew. 3. Subject Catalogue in Yiddish : still under construction, and less elaborated than the subject catalogue in French. Subject searches are more efficient for now in French than in Yiddish. 4. If you do not have a Hebrew keyboard, or if you are unable to activate this function on your computer, you can perform searches for works in Yiddish using the author’s name in Latin characters, transcribed following YIVO rules.